Dollar is being supported by stronger Manufacturing PMI data and the Fed officials’ remarks. 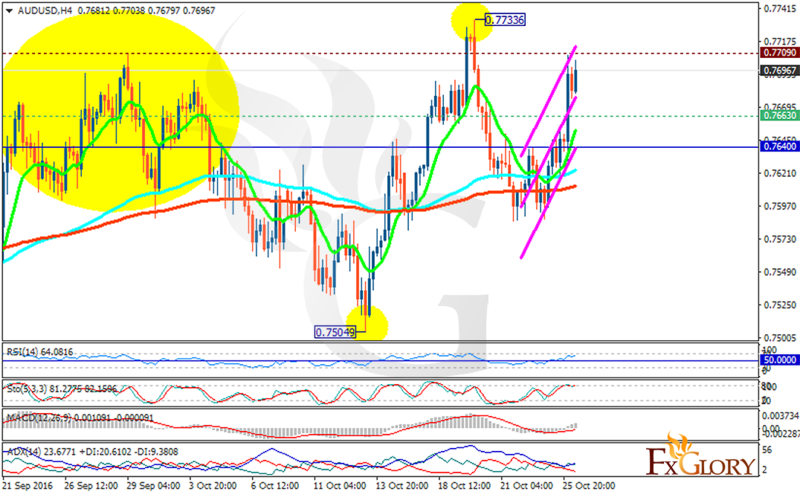 The support rests in 0.76630 with resistance at 0.77090 which both lines are above the weekly pivot point at 0.76400. The EMA of 10 is moving with bullish bias and it is located above the EMA of 100 and the EMA of 200. The RSI is moving in the overbought area above the 50 level, the MACD indicator is in neutral territory and the Stochastic is moving horizontally in its maximum rate. The ADX is showing better buy opportunity than sell. The 0.77 area seems to be a strong resistance zone for this pair, short-term long positions are recommended but then the pair will not grow further from the resistance zone, and sellers can target 0.7675.